Welcome to the Falcon Genius Squad! You are joining an incredible community of supportive teachers, administrators, and students and we are all here to help you have a successful year! Please visit this site often should you have any questions regarding your new iPad. Genius Squad students are ready to assist you with any and all technical issues you may encounter. They are also available to provide you with recommendations on the best iOS apps to help you stay organized and create the most innovative digital products for your class projects. 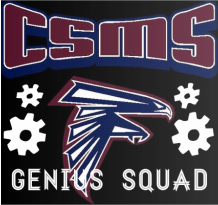 Again, on behalf of the CSMS Genius Squad, welcome to Citrus Springs Middle School!